The journal Law Review aims to publish, in electronic form only, articles, studies, comments, etc. drafted in English by Romanian and foreign authors, that of a Romanian and foreign legal doctrine publication, which promotes the case law of national and European courts (the Court of Justice of the European Union, the European Union Court and the European Court of Human Rights). 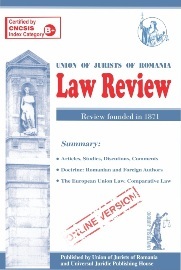 The journal Law Review will include columns such as: “Studies, Discussions, Comments”; “Comparative Law. European Union Law. International Law”; “Doctrine – Foreign Authors”; “Romanian and Foreign Case Law” a.o. The editorial team kindly asks Romanian and foreign authors to comply with our requirements regarding the structure of articles, which should include a summary, keywords, an introduction, sections with individual titles, conclusions, and, if applicable, de lege ferenda proposals, and, at the end, the section „references” which should include, listed alphabetically, the works employed by the authors in drafting their article, as well as other works, which were not necessarily employed in the article, but are related to the topic in question.